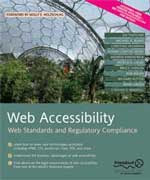 Tweets were recently going around about free online/e-books relating to web accessibility. They point to the web page 6 free online books about web accessibility by Jitendra. I’ve repeated them here in a simple list and added a Microsoft book and an excerpted chapter by Shawn Lawton Henry from one of the books. Appreciate the roundup! (It actually seems like a useful roundup and not a mindless Google search). Any one of these your favorite? The first one listed (from Friends of Ed) is more recent and most comprehensive.